Brunswick Heads, Byron Bay, Bangalow, Suffolk Park, Lennox Head, Lismore, Goonellabah, Wollongbar, Alstonville, East, West and Central Ballina, Ballina Heights & Palm Lake Resort. BUS SCHEDULES WILL BE DISPLAYED AT THE FESTIVAL. Please check these as there maybe slight changes due to the number of people booking for the various buses. Announcements will be made at the festival and bus information will be available at the festival information office. 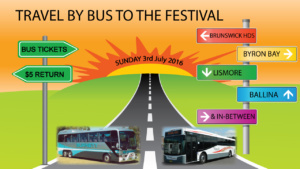 Thank you to Blanch’s Bus Company and Burnett Bus Lines for providing buses for our festival guests.